Hey everyone! Here’s a quick update of everything I’ve been working on lately. Firstly, I’ve been working on a new script for Lenna’s Inception with SamuriFerret. We’ve made some large changes to the story-line in order to ensure all the threads come together into a satisfying ending, and to make sure parts of the story don’t obstruct gameplay. As an example of the latter, several story characters will now contact you via Lance’s mobile when something’s up, so that you don’t have to return to the town and hunt down specific NPCs. From left to right: smileder, sharktula, dolphinja, snail, bombshell. Yes, Lenna’s Inception will finally have water-based enemies - the sharktula and dolphinja. I’ve completely rewritten the monster-spawning code to support this properly. Next up, I’m going to be adding a new follower, and then I’ll start implementing the new script in the game. 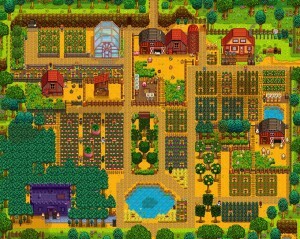 Finally, if you haven’t seen it already, Stardew Valley just released on Steam. It’s well worth a look!